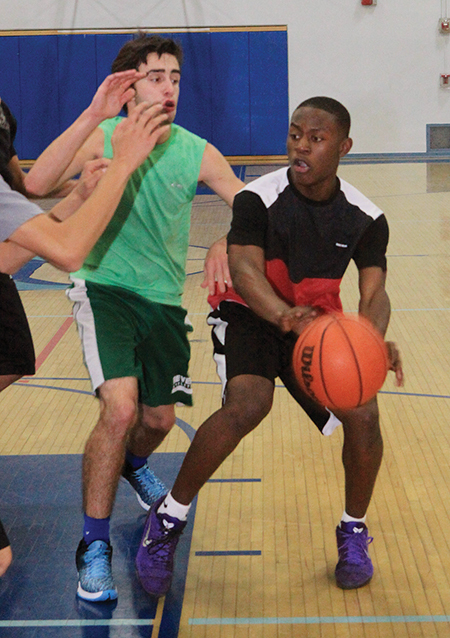 New head coach Donzell Hayes has high hopes for the Palisades High School boys basketball team this year. Last year, Hayes, a 1996 PaliHi graduate, became the team’s interim head coach when previous coach Vejas Anaya left just before the season started. The Dolphins finished the year with a 12-17 record. Hayes, who had previously been an assistant coach for two years, has been im- pressed by the current team members who both work hard and share a strong camaraderie with each other. The Dolphins have already played in two tournaments—Maranatha High’s Rose City Classic, in which they went 2-2, and the Jim Nakabara Tournament at University High School, in which they reached the finals and lost a tight game against undefeated Uni, 80-76, on Dec. 9. Pali’s tallest player is 6-5 senior center Diego Malcynzynski, and the team has four 6-2 players, including standout senior forward Dayne Downey, who has had an exceptional season thus far. In the Nakabara final against Uni, Downey scored 27 points, collected 14 rebounds and made three assists. He also scored 20 points in the tournament game against Cleveland. The Dolphins lost two starters from last year: forward George Brown and guard Will Johnson, who earned Most Outstanding Player honors in the Western League and first-team All City. In addition, center/ forward Angel Villalta graduated. However, the eight seniors on this year’s squad provide a strong backbone for the team. Before losing to Uni, the Dophins had racked up a four-game winning streak over two tournaments. They beat the Renaissance Academy 64-44, triumphed over Cleveland High 69-39, won against View Park 68-57, and raced past North Hollywood, 65-45. In its season opener on Nov. 29, Pali scored a satisfying win against Crowley, 63-43. However, the team also suffered two losses in the Rose City Classic—a tough 68-65 fight against Cantwell-Sacred Heart and a 60-40 loss to Fairfax, a peren- nially challenging league opponent. Typically, the Western League, which also includes Uni, Westchester, Venice, LACES and Hamilton, is “the toughest league,”Hayes said. “It’s a battle every single night— the worst team in the league or not.” Last year’s Dolphins went 5-7 in league. During the regular season, Pali plays each league team twice—once at home and once away, and all of the teams tend to perform well in the playoffs, Hayes said. 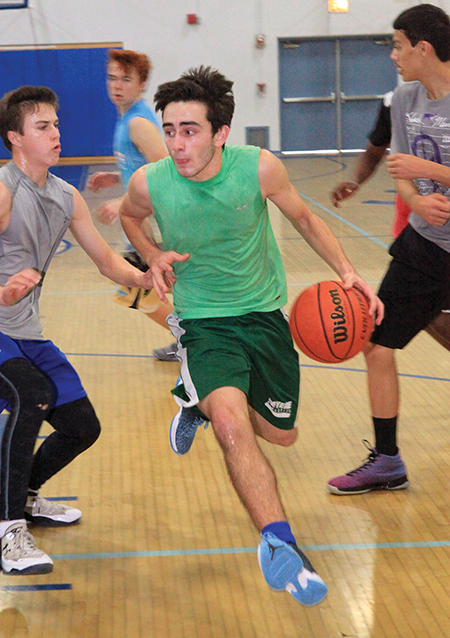 Pali’s roster includes point guards Anthony Spencer and Nick Kerkorian, guards Jackson Chmara, Michael Spencer, Daniel Emein, Jeron Artest and Dylan Griffin, guard/forwards Teddy Suisman, Chris Kurihara and Zack Lynch, and forwards Pierre Kaku, Kevin Eng and Avi Massaban. 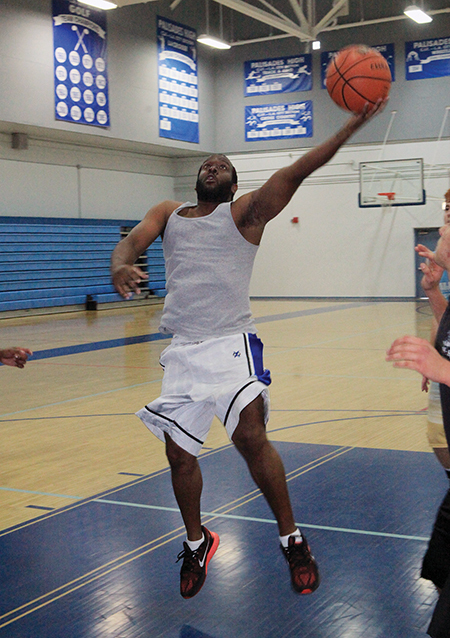 The team’s league season starts on Jan. 9 with a home game against University at 5:30 p.m., although the team has one more tournament at Dorsey from December 27-29.